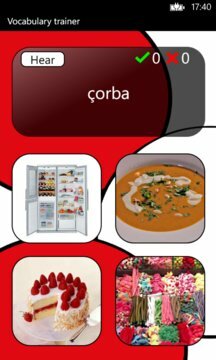 ☆ Vocabulary trainer: choose the corresponding image to the Turkish word given. ☆ True or false: select whether the shown translation is true or false and answer as many as you can in 60 seconds. ☆ Spelling test: spell the given Turkish word correctly without getting a letter wrong. ☆ Hangman: guess the Turkish word by choosing one letter at a time with only a limited amount of guesses. ☆ Anagram: rearrange the letters to guess the jumbled Turkish word. ☆ Word search: find all the Turkish words hidden in the word grid using the English translations as hints. 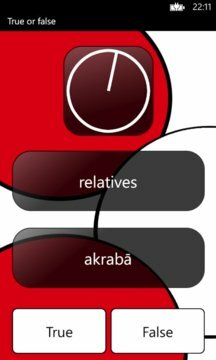 ☆ Memory match: flip over two cards at a time to find the Turkish word and its given translation, until all pairs have been found. ☆ 17 categorized flash card sets for speed learning new vocabulary, including adjectives, adverbs, numbers, common objects, transportation and so on. If you like Rosetta Stone, Byki, Rocket Languages, Busuu, Babbel, Transparent Language, Fluenz, Pimsleur and Tell Me More then this Turkish language learning software is for you. In order to improve the quality of this app and to enhance your learning experience, we welcome comments on improvements.